Size of the bag is 18 x 13 x 8. Large size tote bag. 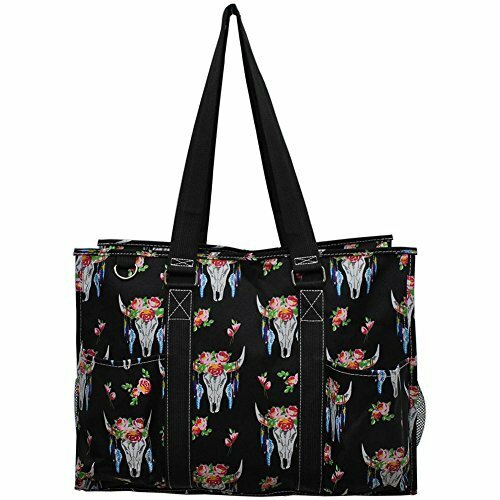 Can be used as diaper bag, shopping bag, overnight, weekender bag, beach bag, storage bag, craft bag and more! Cute all purpose utility tote bag. Light Weight. Collapsed when not used. Great organizer bag: 2 front open pockets, 2 rear pocket with one velcro flap closure. In addition, side mesh pockets on both sides, and mini side pocket for small items.Constructed with water resistant nylon material. Zip top closure. Key ring in front. Double carrying handles. Handle drop approximately 14". Great gift idea for your friends and family. Cute all purpose utility tote bag. Light Weight. Collapsed when not used. Constructed with water resistant nylon material. Zip top closure. Key ring in front. Size of the bag is 18 x 13 x 8. Large size tote bag. Can be used as diaper bag, shopping bag, overnight, weekender bag, beach bag, storage bag, craft bag and more! Great organizer bag: 2 front open pockets, 2 rear pocket with one velcro flap closure. In addition, side mesh pockets on both sides, and mini side pocket for small items. Double carrying handles. Handle drop approximately 14". Great gift idea for your friends and family. If you have any questions about this product by NGIL, contact us by completing and submitting the form below. If you are looking for a specif part number, please include it with your message. Canvas Tote Bag with Inspirational Saying- Zipper Top, Interior Pocket "Make the Days Count"